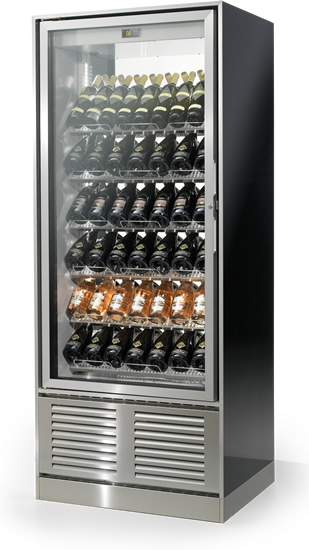 Galaxy represents the NEW MODULAR way to configure a contemporary bespoke wine display to suit your own application, mix and match this high quality range to create a unique front of house feature. Discerning customers rate the front of house environment above both reputation and value, so why not allow Galaxy to create a striking statement wine display that adds to the restaurant ambience with the potential to increase wine sales. Galaxy is available in a wide range of finishes, configurations and sizes, you select and design the system to meet your requirements. 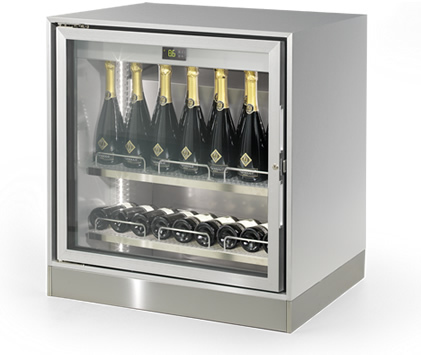 Bottles can be accessed from either side of the Galaxy Module allowing you to create a fantastic wine island feature and fully flexible zonal temperature control means that presenting Champagne next to Chianti is now a cost effective reality. Each module is offered either ‘naked’, to be integrated in existing furnishings, or ‘dressed’, with a wide range of serial and custom-made finishes that can suit any ambiance. If the space furniture changes, all it needs is changing the dress. All the system elements are sized according to a modularity criterion so that it is possible to create an infinite number of configurations for any kind of space and displaying/conservation need: they can be mono and bi-facial, have one or differentiated temperatures and have on board or remote engine. Minimalist in style, the frame is constructed to be strong whilst creating the perfect combination of light and shade effects to highlight the displayed products. An elegant, recessed handle provides an excellent grip whilst maintaining the clean lines of the design. 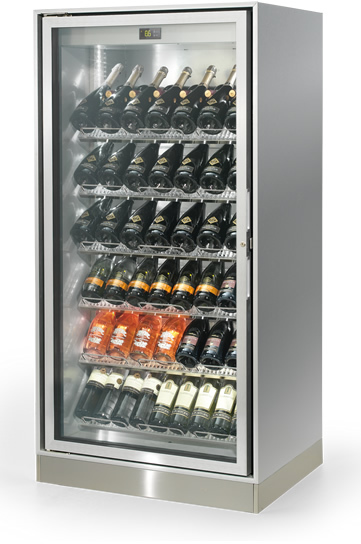 Single (Wall) or double side (Island) exposure for maximum capacity or better visibility of the bottle. 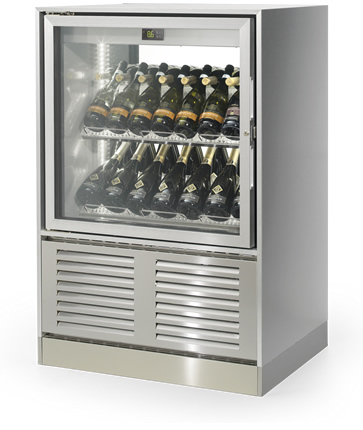 Each display cabinet can be opened with glass doors either from one side, with a fixed back (blind or glass-topped – Optional), or from both sides. The shelf system permits great flexibility and adapts to different exhibition displays. Users can choose their preferred composition, favouring either capacity or visibility. 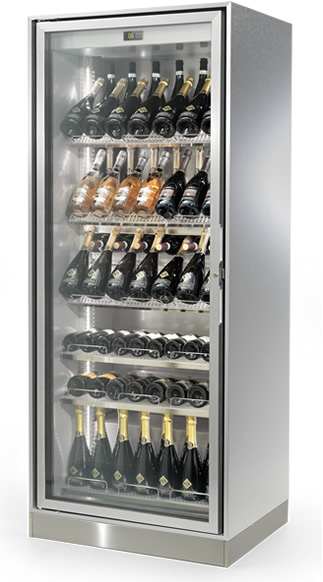 A versatile system of easily repositioned shelves and the absence of grilles and cooling devices that protrude into the bottle compartment permit full use of available space, maximise functionality and practicality and ensure easy access to contents.